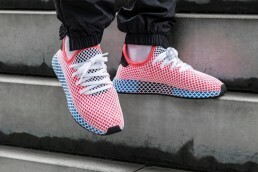 For the launch of the new Adidas shoe Deerupt, Adidas launched an immersive campaign. In addition to the interactive website that features an AR experience, Adidas wanted to use virtual reality in collaboration with their partner Foot Locker. This way all possibilities of immersive media can be explored. 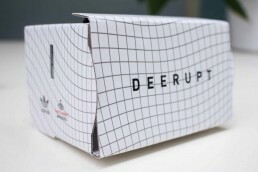 "A VR presentation where all facets of" immersive media "could be used"
The choice was made for an online campaign in which consumers were able to win a branded Cardboard with a link to the VR experience. Adidas and Foot Locker wanted to keep the threshold for participation low, therefore a mobile application would be out of the question. In collaboration with JamJam we developed a WebVR campaign that allows the use of virtual reality with almost every mobile device. Several posts were shared on the Foot Locker Facebook page in order to promote the contest. Participants had to crack a code on the promotional website. The first successful participants won a Google Cardboard for viewing the 360 experience at home. WebVR is a solution that makes it possible to experience virtual reality in every browser. There’s no requirement for downloading an application first. The browser will recognize the type of device and will configure the settings accordingly. The viewer only has to enter the link to the website and the experience will start automatically.